It’s a spring tea party and everyone is invited! Essie’s new spring 2019 collection has arrived and it’s pastel, shimmery perfection! Six shades that are sure to get you in the mood for spring sunshine and the warm weather ahead. I took ‘Pinkies Out‘, ‘Teacup Half Full‘, and ‘Tiers of Joy‘ for test drives alongside a few spring tea party inspired looks. Be sure to also check out the other newest shades – ‘Reign Check‘, ‘Stirring Secrets‘, and ‘A Touch of Sugar‘. 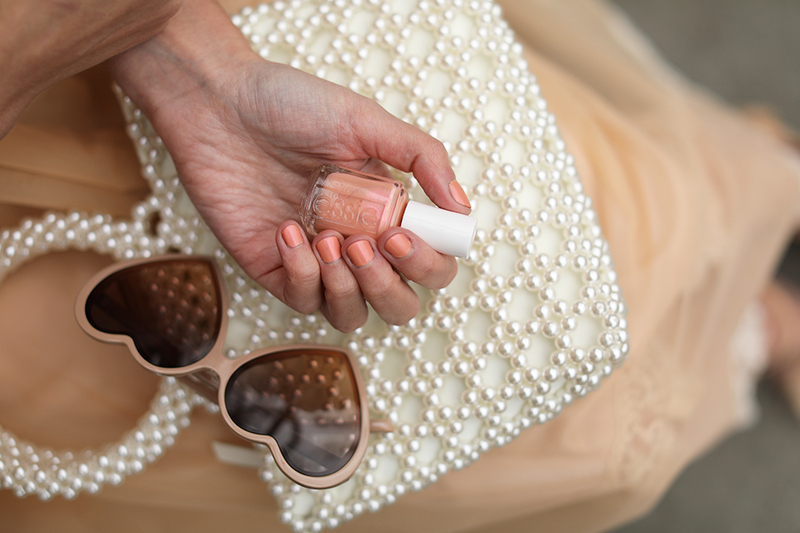 Click here to discover Essie’s full spring range! one // Nail Polish: ‘Pinkies Out‘. Dress: Simone Rocha. Shoes: Hampden Clothing. Bag: Topshop. Sunglasses: Nordstrom. Hair Pins: Amazon. two // Nail Polish: ‘Teacup Half Full‘. Dress: Preen. Headband: Eugenia Kim. Shoes: Banana Republic. Sunglasses: Saint Laurent. Bag: Staud. three // Nail Polish: ‘Tiers of Joy‘. Coat: Zara. Shoes: JF. Sunglasses: Saint Laurent. Bag: Staud. Suit: WeAnnaBe. Sweater: J.Crew. Thank you to Essie for partnering on this post! Love ♥️the natural look of real nail with these Spring lacquered colours … so naturally beautiful! You always look so pretty and chic! All the looks are again perfect! I love how the second nail polish compliments the brown in your floral dress and I also love how the 3rd nail polish sticks out with your dark brown coat! Girl you epitomize the word colourful! Girl you definitely epitomize the word: colourful! Never in a million years did I think a blue nail polish would compliment a dark brown coat! Dying over ALL of these shades! SO gorgeous for Spring. me: do i reeeeeally need a giant bow headband? me: yes, obviously…it’s a neutral and it goes with everything. haha okay i’m done now! love this post blair and these colors are amazing!! I am loving the nail colors and your outfits!! So cute! Absolutely stunning looks consisting of all the new fashion trends – floral patterned dress and suit, pearl bag and hairpins and nail polish in pastel colours. As a big fan of luxury leather goods, can’s skip the black leather bag by Staud – it is marvellous! Absolutely stunning looks consisting of all the new fashion trends – floral patterned dress and suit, pearl bag and hairpins and nail polish in pastel colours. As a big fan of luxury leather goods, can’t skip the black leather bag by Staud – it is marvellous! These are really beautiful nailpolish shades! You have a way with colors! These outfits are so beautiful! I love all the pearls and pastels. These looks are absolutely amazing. Just the right thing to brighten up my spring. These colors are perfect for spring!! I’m loving your first look, so cute and springy! Love the nail colors and Essie is definitely one of my favorite brands. These are all lovely nail polish colors! Essie is a brand I use every once in a while and their polishes always last well.